We've had a remarkably heavy backlog of cases in house in desperate need of review over the past couple of months, and one of the standouts has been BitFenix's Shinobi XL. We were generally pretty pleased with the original Shinobi when we first reviewed it. 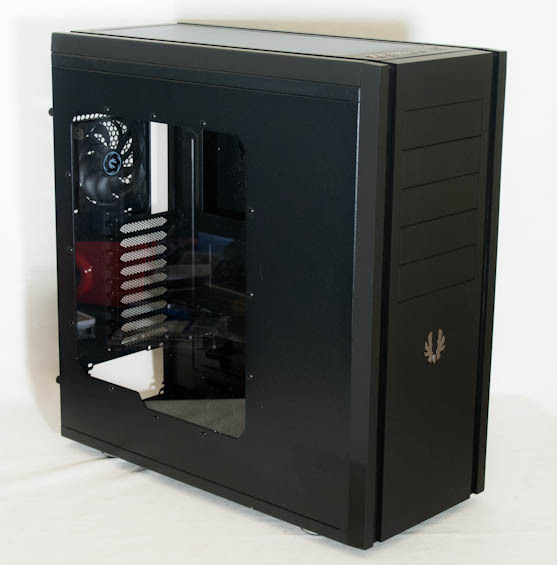 Seventy bucks for a solid budget enclosure with great styling was a killer deal, and the enclosure itself has a lot of room to grow for the budding enthusiast. As it turns out, the Shinobi has been a pretty big hit for BitFenix. Big enough, in fact, that they decided it needed to go...bigger. And so it did. BitFenix released the Shinobi XL earlier this year, but reviews for it have been fairly scarce and even a little bit dismissive in some cases. We have an opportunity here to rectify that and determine if the newer, larger Shinobi lives up to the legacy of its little brother, or if BitFenix has lost some of the magic in enlarging their budget design. It's most definitely bigger. While the Shinobi was a standard ATX case (and a fairly small one at that), the Shinobi XL is all-in, with nine expansion slots and able to support XL-ATX motherboards. While it shares a lot of the design language of its predecessor, the larger scale allows two of the fans to be upgraded to 200mm parts. I'm not sure bigger is necessarily better, though. Dimensions 22.44" x 9.65" x 21.93"
Unfortunately I don't have a weight statistic for the BitFenix Shinobi XL other than "it's heavy." The chassis really is in many ways just a giant Shinobi, with a steel frame and then the soft-touch plastic finish. What's also a bit alarming is the price tag: at $159, the Shinobi XL is more than twice as expensive as its predecessor, making it an unusual heir to the Shinobi throne. As a bit of good news, though, BitFenix cases are now finally available on NewEgg. I'm actually personally really happy to see this, as it both raises the profile of BitFenix and also makes more widely available what I consider some of the best budget cases available. Sorry i wasnt specific enought. Dustin you really hit the nail "modern conventions are far from perfect and there's a lot of room for improvement". As an example, the case is wide - why not turn the PSU 90 degrees and have the cables feeding directly into the area behind the motherboard. Lian Li at least experiment with different locations. I would love to see a case where there is a built in power splitter for the 5.25 bays and Hard drive cages so one molex cable goes to a daughter board which has several socket to run short cables up to the hard drives for example - a bit of imagination would result in a very neat cabling job. The review compares a mATX case 2/3 of the price of this case, an aluminum case with almost no water cooling support that's 2x the price, and ambient temperatures that vary with each review resulting in a default temperature, and noise level being already higher, or lower. Anandtech doesn't test watercooling as far as I know. Must admit I cannot remember Anandtech reviewing watercooling either. Watercooling is a niche for those who like to have a bit of fun and get their hands dirty (I think that should read "wet") on the innards of their computer. I love it, but I know it is not very everyone.